Newlywed couples used to get pelted with grains of rice at their send off, but thankfully there is now an alternative to this ritual. Using wedding sparklers for your wedding send off is a unique idea that has been growing in popularity over the last few years. Thinking of using sparklers for your send off? If you make sure to inform your guests of the event and supply them with matches or lighters, this will ensure that the wedding day sparklers will be ignited simultaneously. As for safety, make sure to have an exit route free of any obstructions, so that the bride and groom can be sent off by their guests without incident. Everyone wants their wedding to be different and fun, which is why many wedding sparkler customers have chosen to make their experience a unique one. To make your experience more personal, paper sleeves with the bride and groom’s names can be added to each sparkler — just make sure to take them off before lighting it up as this can be a fire hazard. Also, since guests will have to be provided with matches of some sort, why not customize a match box for each guest with a picture of the happy couple and their wedding date? One of the most common mistakes reported when choosing to use wedding sparklers is forgetting to receive permission from the wedding venue before ordering. Since wedding sparklers cannot be lit without a flame, some venues strictly prohibit their usage when indoors. If the venue of your choice has regretfully declined your request to use wedding sparklers indoors, don’t be discouraged. 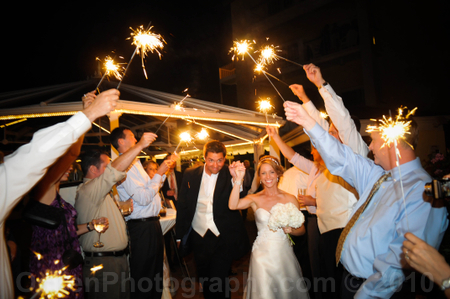 Wedding sparklers can easily give off a similar effect when lit outdoors and are perfect for sending off newlyweds at the end of the ceremony.